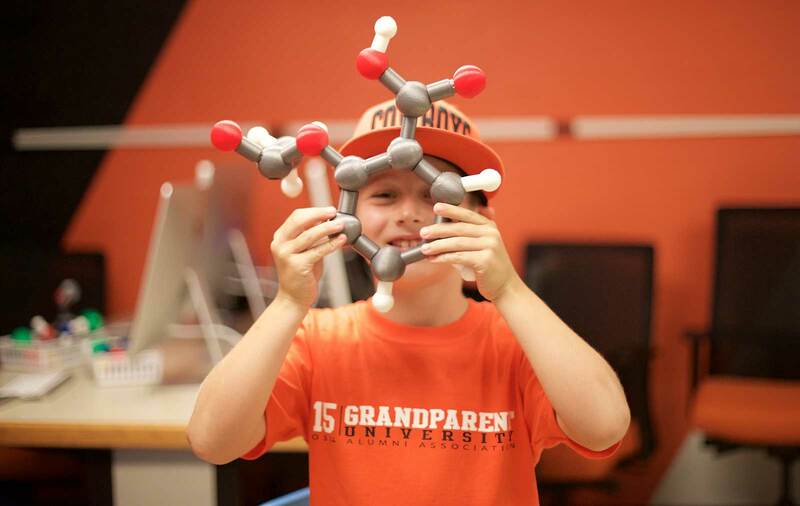 Fun with Molecular Modeling, for kids young and old! As chemists, we like to think about objects at the atomic scale. The molecules in our Molecular World Building class are all composed of atoms. In molecule building, we introduce the notion of atoms and bonding between atoms. Much of the discussion involves treating atoms in terms of size, color, and local geometry. To enable this, we use an internally designed and 3D printed Awesome Molecules Kit. Why design and 3D print a molecule kit? The key issues are cost and educational functionality. There are a lot of types of kits commercially available, though they can be quite expensive and are often poor from an educational perspective. We want to introduce atoms as unique objects with their own characteristics, like individual PokémonTM. Atoms have proper relative size and are colored according to the commonly used atomic coloring system. When holding and working with properly sized fluorine and iodine groups, kids form an appreciation for steric considerations imposed by the much larger iodine atoms. And 3D printing is a relatively newly accessible technology, so that makes it more interesting because we are creating what the kids in turn create with. We have been able to get costs down considerably by doing this; each kit comes in at around $5 in materials. This means that each child can walk out of the program with something that they can use for years after. The molecule building program is designed with creativity as an underpinning. Each of the kids is encouraged to build the 21 “Awesome Molecules”, molecules chosen because of their everyday importance like aspirin (see the above image) or simply for fun, like putrescine. These awesome molecules are presented in a companion activity booklet that contain structural diagrams and “awesomeness” facts. The idea is to help the kids gain a molecular level familiarity and appreciation for the world around them. They are also tasked with building their own original molecule, and they also build this on computers in lab. These molecules that they design are used in later Molecular World Building programs, and we also 3D print them as fixed structures for participants to take home. In Molecule Building, we explore how atoms come together to make molecules. In Molecular Interactions, we investigate how molecules come together to make the materials in the world around us through intermolecular interactions. There are many classes of intermolecular interactions, but we focus on one general type of attraction (and repulsion) and the specific “bond” that is a result: electrostatic interactions and the resulting hydrogen-bond. To enable interactive exploration of molecular interactions, we designed a variant of the Awesome Molecules kit that incorporates Neodymium magnets to mimic the attraction and repulsion of hydrogens and oxygen lone pairs. We use this system to build DNA base pairs that kids can hold and manipulate, and they allow us to discuss why A&T and C&G pair. Because of their differing numbers of hydrogen-bonds, there is matching complementary geometries, and the strength of the pairing interactions is different. The kids can feel the difference between 2 and 3 hydrogen-bonds with their hands, and this helps build an appreciation for the differences in mechanical properties for groups of base-pairs in a DNA strand. One of the key interactive activities involves the use of the designed and 3D printed magnetic water molecules. We use them to discuss the structure of ice by having the kids build hexagonal ice Ih from a template. I actually use these when I teach the concept of residual entropy in my undergraduate Physical Chemistry classes. In the main activity, kids are given the task of building optimal water clusters with a fixed number of water molecules. We have “solutions” from computational chemistry calculations, but such solutions are hardly necessary when the kids have a molecule that fits in there hand and links in the proper geometric way. They are usually able to get most of the optimal structures with only a small amount of guidance (like Cassidy is providing in the above image). I have had kids tell me that they are more fun to work with than LegosTM, which is great because they are learning about geometry and cooperativity at the molecular level. In Molecular Interactions, we build structures out of the magnetic water molecules. Some of these are quite stable and form well ordered crystals. However, sometimes things are simply disordered. Maybe the temperature is too high or maybe the molecules get stuck before they can crystallize. Getting stuck like this is called “glassy”. How molecules stick and pack tells us a lot about the properties of the resulting bulk material. Will it be flexible or brittle, for example. In Molecule Packing, we uncover fundamental insight into how molecules arrange relative to one another in confined environments. We do this without any measurements on experimental molecules or measurements on computer models for molecules. To find out how molecules pack, we use large scale mimics of molecules: RuntsTM candies! 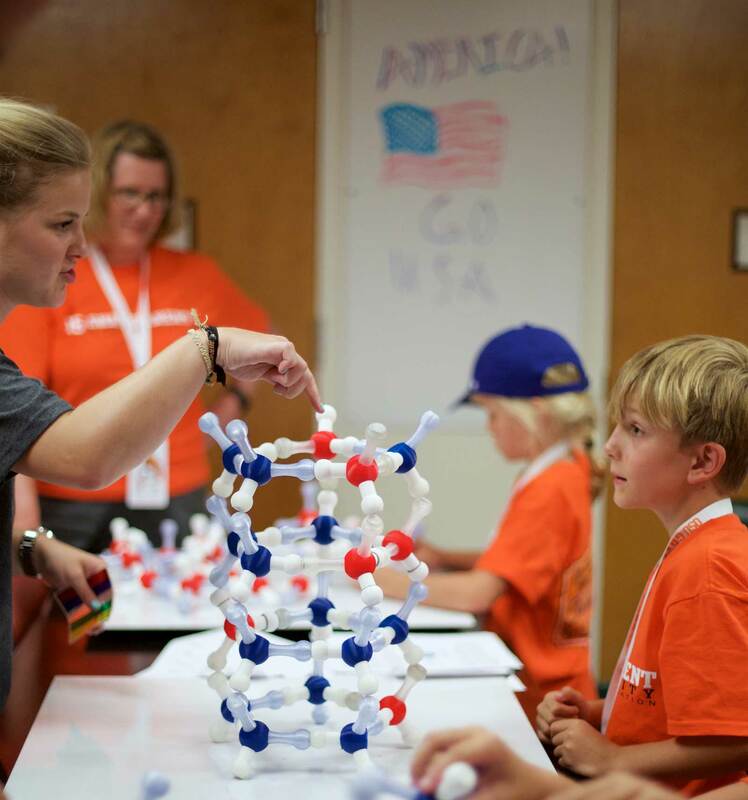 In this portion of the Molecular World Building program, participants are tasked with creating their own molecule containers with a fixed area of matte board and packing them to the gills with candy of a particular shape. What shape should they choose if they want to pack the most “molecules”? Most kids participating in the program have yet to take a class focused on geometry. They need to be introduced to shape and surface area and the connection between the two. To do this, we crafted and 3D printed containers with identical inner surface areas, however, they have differing shapes, running from a triangular prism up through a cylinder. They then all measure volumes by filling the objects with water. Seeing the trend in volume with shape give them an idea of what shapes they should try to build. Kids are then given tape and fixed surface areas of matte board and let loose. I provide them with some geometric mapping directions for a series of 3D objects, like a tetrahedron or rhombic dodecahedron, but they are free to do whatever they like. Once built, the kids choose a candy to fill them with: orange, strawberry, or banana RuntsTM (see some of the candy funneling above). The goal is to get the most candy by weight, but indirectly they are learning about how shape directs packing properties for molecules. We follow this experience with a presentation describing glass formation of molecular system on the campus supercomputer, and how the results from similarly shaped molecules track the candy results. In Molecule Packing, we use an abstract, yet familiar, representation of individual molecules: candy. Seeing real individual molecules is quite difficult. This requires expensive microscopes, extremely cold temperatures, and it can often still be only done with specific molecules on select surfaces. When you build your molecular world on a computer, these restrictions do not exist. We can look at molecules in a variety of ways. In many respects, we are only limited by our imaginations. Each of these modular components are focused on providing participants with a new experience that is both informative and educational. In short, the first version of the kit was designed and printed in-house in the spring of 2015 for my Grandparent University program. It was LARGE, as seen in some of the modular program pictures above. The kits evolved for the extension program for Kids' Tech University, and settled at revision 2.1 for 2016 Grandparent University and the Juntos Summer Academy. The new kits were small, cheap, and fast enough to print that I could give them to participants! The Awesome Molecules Kit is entering revision 3, and I will provide details on all the kits once this one is together. 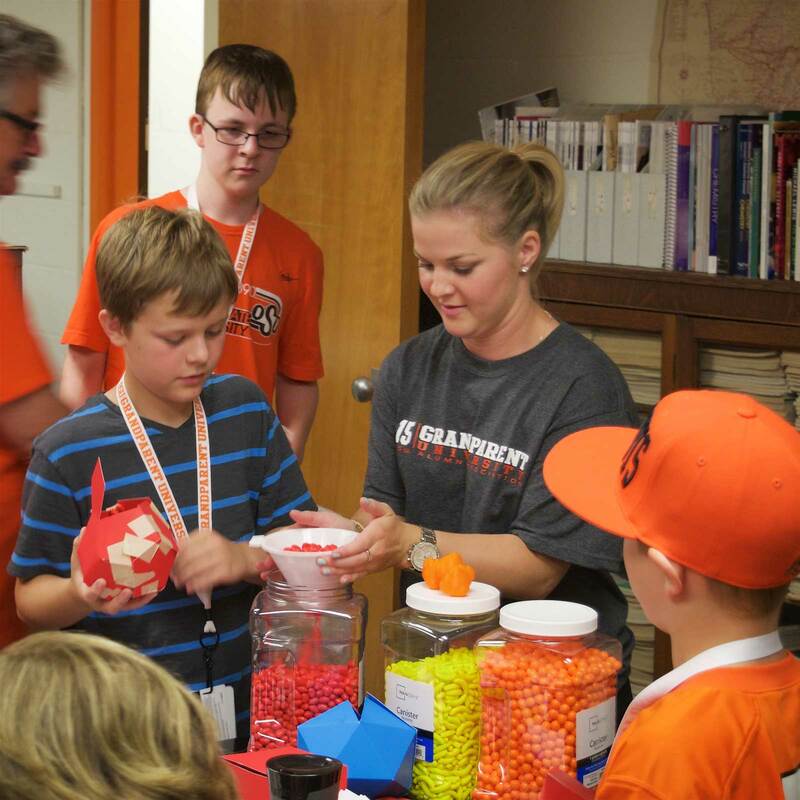 About: Grandparent University is an intergenerational summer camp for families of Oklahoma State University Alumni. Kids aged 7-13 come to participate in interactive collaborative activities. I was the Faculty Host for the event in 2014, giving talks on the size of molecules for the roughly 500 participants. This year was the first instance of the Molecular World Building program, where we work closely with around 25 kids and their Grandparents. Special thanks to Dr. Gabriel Cook for helping out with the sessions! More details about Grandparent University can be found on the links at the bottom of this page. About: Nearly a thousand high school girls and high school STEM educators converge at the Mabee Center in Tulsa to experience science related opportunities in the state of Oklahoma. This was our first external introduction to the interactive Oculus Rift experience with virtual molecular worlds. It seemed popular as I don't think Cassidy and I got much of a break the entire event. Special thanks to Dr. Laleh Tahsini and Dr. Yolanda Vasquez for coming along to do some chemical system demonstrations that coupled with the systems we loaded on the Oculus Rifts! About: This was a fun event organized by Dr. Allen Apblett and Dr. Nick Materer along with the Oklahoma local ACS section. We had booths that presented interactive activities involving chemistry for the general public. I did the Oculus Rift virtual molecular worlds module with two of our headsets. It was a lot of fun, and some of the kids were quite enamored with the experience! My booth got featured in the local newsletter too! About: This is a new on-campus event to promote fun research related experience to undergraduate students in the Life Sciences. I did the Oculus Rift virtual molecular worlds module with Dr. John Gelder, and we had an article featured on our involvement in the first HHMI newsletter! Program Title: Why do snowflakes have six points? About: I will probably need to do a full write-up on this experience. Dr. Kristy Collins at Virginia Tech invited me out to do an interactive lecture for roughly 250 9-13 year-old kids. It was loads of fun, but in short, I 3D printed miniature Awesome Molecule Kits for all the kids, complete with activity booklet. With the afternoon interactive booth, I ran a Oculus Rift molecular visualization and magnetic water structure sessions. Special thanks to Heather, John, and Becky Button for providing on-site 3D printing of the ice crystal lattice snowflakes! About: The second instance of the complete Molecular World Building program. This time with refined/expanded projects and most importantly, the kids get to keep their Awesome Molecules Kits! More details about Grandparent University can be found on the links at the bottom of this page. About: A reduced version of the Molecular World Building program used for Grandparent University, reduced because we only had 4 hours. 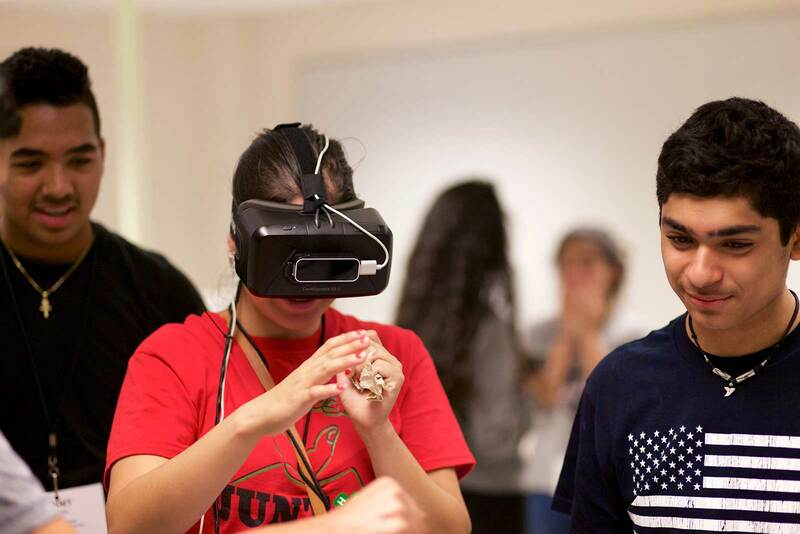 The Juntos program brings middle school aged hispanic students from immigrant families in the Tulsa, OK area for an interactive college experience. The program runs for over 2 months, but this visit to Stillwater is one of their highlights. It was a highlight event for us too! About: The 2nd Annual Fall Social for Oklahoma State HHMI, the "I'm Proud to Be a Life Scientist" event brings together participating departments and program groups to promote research and scientific opportunities to life science undergraduates at Oklahoma State University. The Molecular World Building presence showed off virtual molecular worlds using the Oculus Rift and LeapMotion interactive systems to give a molecular level view of DNA and other bio-related molecules! About: As in the 2015 event, nearly a thousand high school girls and high school STEM educators converge at the Mabee Center in Tulsa to experience science related opportunities in the state of Oklahoma. We showed new molecular world systems that explored polymer/water interactions and hydrophilicity of interfaces using the interactive Oculus Rift systems. Special thanks to Dr. Yolanda Vasquez for coming along to do lithography demonstrations of flippable hydrophilic/hydrophobic surfaces! About: The complete Molecular World Building program, enhanced over previous years! Now with molecular tattoos and laser cutters! Yes, the kids still get to keep their Awesome Molecules Kits, further redesigned to make for easier assembly. We actually laser etched our own currency (Phenyl Bucks... thanks Jen...) for this event, and kids assembled molecular containers out of laser cut panels. GPU, now with more laser action! More details about Grandparent University can be found on the links at the bottom of this page. About: The 3nd Annual Fall Social for Oklahoma State HHMI, the "I'm Proud to Be a Life Scientist" event brings together participating departments and program groups to promote research and scientific opportunities to life science undergraduates at Oklahoma State University. The Molecular World Building presence showed off virtual molecular worlds using the Oculus Rift + Oculus touch interactive systems to give a molecular level view of DNA, water, myoglobin and other bio-related molecules! And there are more sessions on the horizon. Events away from my lab in Stillwater usually involve the Oculus Rift interactive sessions and maybe the magnetic molecule kits. It tends to be difficult to relocate printers and supercomputers!